Life’s lessons are hard learned some times. Unfortunately I have found myself in attendance at the school of hard knocks far too often in this life. Apparently the Lord thinks there are lessons we need to learn, and if we don’t learn them on our own he sends us to that school in life where we’re taught the hard way. I don’t know if there’s a specific lesson I learned from my recent bout with hard knocks – and rocks, but perhaps there’s an analogy in it that we can all benefit from. Last December I did a WONDERFUL thing, I bought a Specialized Stumpjumper FSR – an incredible full suspension mountain bike. I caught the biking bug and started riding on a regular basis. I’ve found it to be a great way to exercise, a wonderful way to release tension and on top of all that it’s exhilarating. It’s the exhilarating part that got me into trouble the other day. I got up early one day last week. It was a crisp morning. I had packed all my gear the night before and slipped out the door before anyone else was awake. I like to ride at the old military base Fort Ord. There are miles and miles of open trails there. It’s a paradise for hikers, runners, horseback riding and mountain bikers. I drove the 45 minutes there and strapped on my gear and peddled my way along the trails to a fast heart rate. I had been riding for about 45 minutes, a little over half way, about 7 miles into my ride. I was in the middle of nowhere, far from the city and deep into the trail section of the park. I had just finished a particularly difficult part of the trail called the Three Sisters. When I first started riding Fort Ord it took me 4 trips before I could make it over the top of them without having to get off my bike and walk. I can make it over them now, but it’s in granny gear going about as slow as you can go up hill without tipping over. At the end of the Three Sisters is a downhill trail, a ‘single track.’ A trail wide enough for just one person, or one bike. The vegetation is typically clipping you in the arms or feet at the sides of the trail. A mistake will put you right in the bushes, trees or down a hill if you don’t keep yourself in control. I had made it to this single track, my legs were throbbing from the hills and I was blasting through the trees happy to be done with the hardest part of the whole ride. That’s when I fell. One of the greatest things about Fort Ord is that the conditions change constantly. Rarely is the ride just like it was last time you were there. The rain, or lack of it, will cause the dirt to be hard packed or loose. As will the fact that horses, hikers or other bikers will tear up different parts of the trail. You never really know what the next turn will have in store for you. As I whipped around the trail, I hit a particularly soft patch that I wasn’t expecting. I could tell I was losing traction in my front tire, so I tried to compensate and bring it back onto the trail. This didn’t help, it actually got me into more trouble as my compensation caused my front tire to not only slide but to turn perpendicular to the direction I was traveling = bad when you’re going faster than 2 MPH. 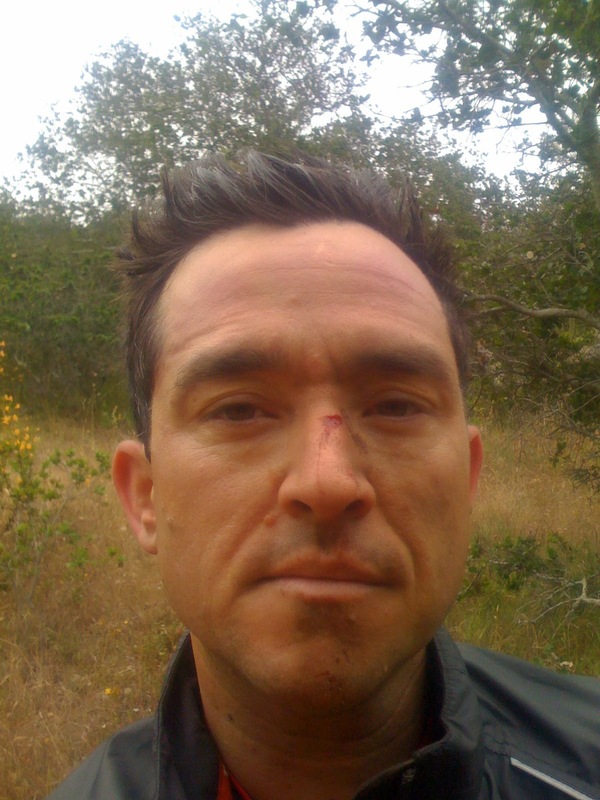 I was going fast enough that when my tire slipped out and turned I had nowhere to go but over the bars and onto my face. As these things happen in life, I felt myself going over and could see the dirt coming at me quickly. There simply wasn’t time for me to stop the actions that were already in motion. I couldn’t stop the fact that I was coming down fast with no time to cushion the blow. My face impacted the ground and the rest of my body piled around me as I screeched to a halt. When things like this happen to me I always do the same thing. I get really quite. I don’t mean I stop talking. I mean that my mind is completely focused on the basics in life; am I OK? I guess you can say I do a System Check. Fingers – check, Arms – check, Legs – check, torso – check, face – OK that hurts but nothings feels broken, etc. Even when I just stub my toe I’ll pause for a moment and evaluate my physical state – am I OK? Did I break the toe, or am I just missing a toe nail? (see above) A little blood, a lot of dirt. After the System Check and the realization that I needed to move on, I had to ask myself , ‘Do I go forward or back?’ Was I in a condition to finish or should I limp back to the parking lot? Fortunately I was OK enough to finish my normal loop. I took it quite a bit slower, but was not injured enough to have to cut my ride short. It seems my pride was the biggest loser in that crash. Obviously there are times we physically fall flat on our faces, most often though, we fall flat personally or spiritually. Sometimes we stray too far from the path and end up making some big mistakes. We end up hanging around the wrong people for too long and allowing them to influence the way we speak, or think. We let ourselves drift into a really bad habit that leads to other bad habits, that all make it seemingly impossible to break away from to get to the place where we know we need to be. Too often we fall down in this game called life and find it hard to get back up. It’s times like this, when we realize we have drifted too far for too long, times like this when we need to do a System Check. 1. Make sure we really are OK. 2. Determine which is the best path for us to take to make it back to peace. Back to that place where we can look ourselves in the eyes in the mirror and know we’re doing what we need to be doing in this life. Often that path is painful and not an easy one, but it’s always worth it. Our Savior died for us, giving us the opportunity to find peace in this life – and to keep peace IN our lives. That is the wonderful part. Even when we make big mistakes, He will take us back, allow us to shake off the dirt from our faces and clothes and start anew. Like me, you will fall someday soon. Whether it’s physical or spiritual, we all end up falling sooner or later. Remember who made it possible to get back on track and be at peace once again. I pray we can all find and hold fast to the iron rod and keep that peace in our lives.